HANOI — Vietnamese Prime Minister Nguyen Tan Dung has stated that the Vietnamese government will help local businesses invest in Myanmar. Mr. Dung made these comments during a recent visit by Myanmar’s Minister of Industry, U Maung Myint, to Hanoi. Mr. Dung highlighted the positive developments that have occurred in the fields of economics, trade and investment co-operation. He also called for further cooperation in 12 key areas which include seafood, oil and gas, telecommunications, aviation and energy. It was further agreed to that Myanmar’s Ministry of Industry and Vietnam’s Ministry of Industry and Trade should discuss specific measures to facilitate Vietnamese business investment in Myanmar. These measures include the licensing of Vietnamese banks in Myanmar. With respect to Myanmar, Minister Myint sought to foster bilateral trade connections in the fields of chemicals, fertilisers, steel and agricultural machinery. These sectors currently lack modern infrastructure and equipment in Myanmar. Mr. Dung affirmed that his government would continue to create favourable conditions for Vietnamese firms to do business in Myanmar. Prime Minister Dung also congratulated Myanmar on its successful hosting of the recent the 24th ASEAN Summit, and added that he had met with Myanmar’s President U Thein Sein to discuss ways to boost economic, trade and investment cooperation between the two countries. In 2014, Myanmar took on the position of Chairman of the ASEAN organization; this has helped boost interest in the newly liberalising country. The Chairmanship of ASEAN is a rotating position which switches on a yearly basis. Another key topic of conversation discussed at the recent Summit and during the meeting between Mr. Dung and Mr. Myint was the controversy over China’s actions in the East Sea, particularly around the new Chinese oil rig that has been placed there. Myanmar’s officials stressed that their consistent policy was that all parties concerned should abide by international law, especially the 1982 UN Convention on the Law of the Sea (UNCLOS) and the Declaration on the Conduct of Parties in the East Sea. Both sides agreed to cooperate with other ASEAN members in order to promote solidarity within the bloc and facilitate the building of the ASEAN Community, which is expected to be completed by 2015. Until 2011, Myanmar’s biggest trade partner was China. However, in an attempt to diversify its foreign relations, the country has carried out bi-lateral investment talks with countries such as Vietnam, Japan, Malaysia and Indonesia. With the country’s joining of the ASEAN community, it has made much progress in its diversification goals. This is not the first time that the two countries have held talks. 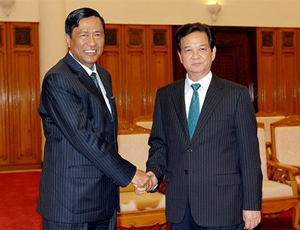 A key meeting took place last year between Vietnam’s President Truong Tan Sang and Myanmar’s Vice President Nyan Tun. During these talks, significant progress was made on a number of issues such as defense, investment, agriculture, tourism and petroleum & mineral exploitation. Additionally, at this meeting, the two countries committed to enhancing investment so that bi-lateral trade would rise to at least US$500 million by 2015.